Jill Jones has published eleven books of poetry, and a number of chapbooks. The most recent are Viva La Real with UQP, Brink, The Leaves Are My Sisters, The Beautiful Anxiety, which won the Victorian Premier’s Prize for Poetry in 2015, and Breaking the Days, which was shortlisted for the 2017 NSW Premier’s Literary Awards. 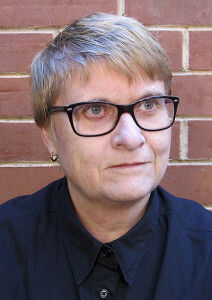 Her work is represented in major anthologies including the Macquarie PEN Anthology of Australian Literature, Ed. Nicholas Jose and The Penguin Anthology of Australian Poetry. In 2014 she was poet-in-residence at Stockholm University. She is a member of the J.M.Coetzee Centre for Creative Practice, University of Adelaide. Everyone loves the female voice. Am I forgiven for having one? to do with simple flowers. It never is. I dissent again, the moon goes as it came. There’s nothing transcendental within reach. grey flannel, car parks, and theories? and women are vaster than history. It’s the way I don’t step forward politely. No point sitting on the fence. I can’t put the leaves back. My affinity is always a question. in my cells or beaten-up memories. I’ll never be as dead as a man.